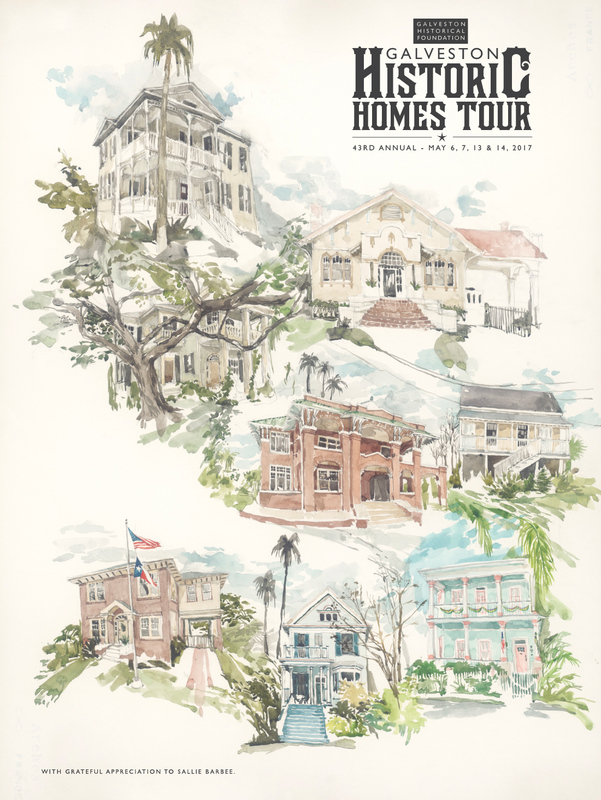 The 43rd anniversary of Galveston Historical Foundation’s Historic Homes Tour not only features ten fantastic island homes, it also will feature a special commemorative print highlighting the homes showcased on this year’s tour. Prints will be available in three different sizes, in framed and unframed versions, and will also be for sale each day of the tour at selected tour stops. This year’s original will also find a home with one lucky auction winner. Bidding is open and can be done below. Sallie Barbee received her BFA in Painting from the Maryland Institute College of Art, Baltimore, MD in 2007, and her MFA in Painting from Tyler School of Art, Philadelphia, PA in 2009. In 2011 she moved to Galveston, TX where she is the Programs Manager at the Galveston Artist Residency. In addition to drawing and painting, Sallie is an accomplished seamstress and knitter. Get your bid in now to own the original, 2017 artwork. Sized at 22.5″ x 30″, the winning bidder will be contacted for payment and shipping after auction ends. Please note: to bid you will need to click on “register” after you click on “submit bid” to create an account with our site.